The stage win gave Bevin a 10-second time bonus, lifting him into the overall lead of the race, five seconds ahead of Italy’s Elia Viviani, who won Tuesday’s stage one but could only manage seventh the next day. Bevin holds a five-second lead over Viviani in the race general classification with Ewan in third place ahead of Germany’s Max Walscheid (Team Sunweb). Walscheid finished 23rd in Wednesday’s stage through South Australia’s famous Barossa Valley wine country in scorching temperatures of 40 degrees Celsius (104 Fahrenheit). “I got to pick a pretty good line in the hard, draggy finish. Once Sanchez was off the front in the final it gave me the perfect springboard and I just went long,” Bevin said. Bevin, whose previous race best in the UCI season-opening tour was 10th in 2016 and 11th last year, avoided a pile-up in the peloton which blocked the road to the Angaston finish line. The crash left around 25 riders to contest the finale with Bevin surging from deep before dipping in behind Sanchez’s slipstream and crossing the line with enough time to clench and raise his hands in celebration. 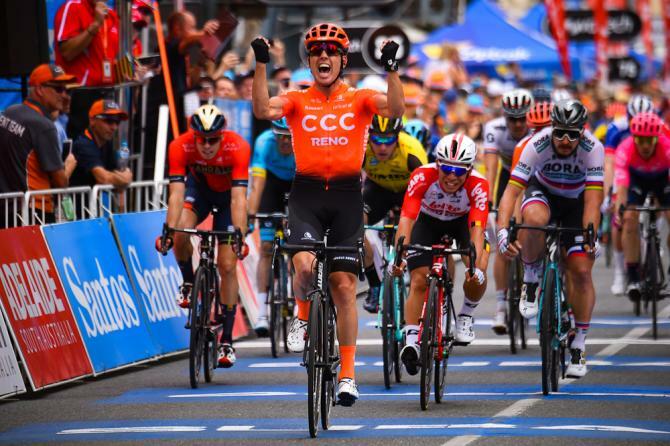 His victory is CCC Team’s maiden World Tour victory and his first triumph outside of a national championship since winning stage four of Australia’s Herald Sun Tour in February 2015. The peloton once again had to endure brutal temperatures on the stage, which was cut pre-race by 26.9km because of the extreme weather conditions. Australia’s Jason Lea (UniSA-Australia) retained the King of the Mountain jersey after stage two from Kazakhstan’s Artyom Zakharov (Astana) and Bevin. Viviani edged Bevin for the sprint leader’s jersey by a point and another to Germany’s Phil Bauhaus (Bahrain Merida Pro Cycling Team). Thursday’s Stage 3 launches from Lobethal into a challenging six-kilometre hills circuit that finishes in Uraidla. The peloton eased its pace with 20 kilometers to go as it made its way through the northern suburbs of Adelaide. But with two final 90-degree turns within the final kilometer, the bunch scrambled for positions as the finish closed in. 3. Peter Sagan (SVK/BORA-hansgrohe) s.t. 4. Danny Van Poppel (NED/Team Jumbo Visma) s.t. 5. Jasper Philipsen (BEL/UAE Team Emirates) s.t. 6. Phil Bauhaus (GER/Bahrain Merida Pro Cycling Team) s.t. 7. Elia Viviani (ITA/Deceuninck-Quick-Step) s.t. 8. Luis Leon Sanchez (ESP/Astana Pro Team) s.t. 9. Kiel Reijnen (USA/Trek-Segafredo) s.t. 10. Kristoffer Halvorsen (NOR/Team Sky) s.t. 5. Artyom Zakharov (KAZ/Astana Pro Team) s.t. 7. Michael Storer (AUS/Team Sunweb) s.t. 9. Jakub Mareczko (ITA/CCC Team) s.t.